… I believe he has ideas about becoming a scientist; on his present showing this is quite ridiculous. If he can’t learn simple Biological facts, he would have no chance of doing the work of a Specialist, and it would be sheer waste of time both on his part, and of those who have to teach him. 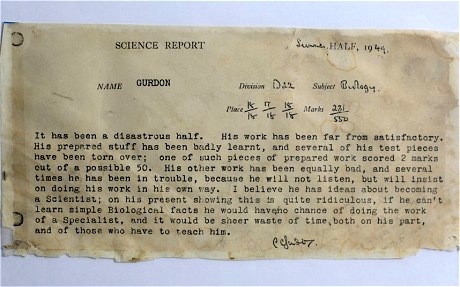 Prof. Gurdon reveals that part of his science teachers report still sits above his work desk. When you have problems like an experiment doesn’t work, which often happens, it’s nice to remind yourself that perhaps after all you are not so good at this job and the schoolmaster may have been right. At elite Eton Grammer School, Sir John was coached by a special teacher who was a curator in a museum and was hired to teach the students lurking at the bottom of the class. His words are less than kind and luckily Prof. Gurdon escaped the tag, motivated himself to do his path breaking work that identified that every cell in the body has the same genes. This was controversial at that time when the prevailing wisdom was different parts of the body have different genetic materials (skin contains genetic material that is different from bones). This understanding led to embryonic cloning of Dolly, the sheep by Sir Ian Wilmut and later reprogramming of adult cells as stem cells to be used in medicine by Prof. Yamanaka (who shares the other half of Nobel Prize with Sir John). Thanks to Abi Arunn at Nanopolitan for the tip. I have been receiving report cards (at least thrice a year) for my two sons. I used to be meticulously filing them, but no longer. None of them have any objective assessment. I have also attended every parent-teacher meeting after those reports, never did one uttered anything strong/wrong. While as a parent I know fully well the areas where they can improve (gibberish spelling and atrocious grammer, for example). A few times I specifically pointed those – with their essays in my hand – the teachers have always been impalpable. Frustrated, I asked one of the teachers if she had anything to say negative about my son’s work at all. Panicked, she said, “No, we have been advised and trained not to say anything negative about the students”. I recall my 7th standard Math teacher K. Subramanian’s (who was also our neighbour) conversations with my dad about me. Oh! those were the days!! Thanks for making that contrast between our age and the present one. Interesting. 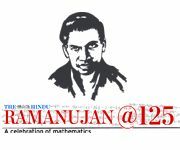 Just a quick correction: That post at nanopolitan is by Arunn who is co-blogging with me there.